Hoover leads the way! Again! UL recently tested and promulgated a listing for an exterior wall system (EWS) containing pressure-impregnated fire-retardant-treated wood (FRTW), which makes the plan approval process for Type I, II, and III construction quicker and easier for architects. Can fire retardant coatings be recognized as fire retardant treated wood? The answer is No according to Code Interpretation 17-005 issued by the California State Fire Marshal. Read more about Can fire retardant coatings be recognized as fire retardant treated wood? FRTW is allowed by UL to be used in any listed wood-frame wall assembly. 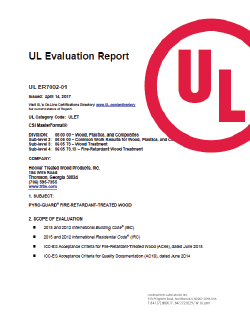 A recent test at UL has resulted in a unique listing for a 2-hour fire-resistance rated bearing wall assembly of Pyro-Guard fire-retardant-treated lumber and Pyro-Guard fire-retardant-treated plywood. This new listing, UL Design No. V314, covers the vast majority of structure exposures providing an alternative to those designers wanting an UL Design number. The Minnesota Department of Labor and Industry has issued the following publication after recent concerns of non-code compliant fire-retardant-treated wood being used in local construction projects. The publication points out the building code requirements for fire-retardant-treated wood and the importance of labeling for proper product identification. The City of Virginia Beach, VA has announced that Pyro-Guard is allowed in roofing structures. Read how Fire-Retardant-Treated Wood can be used in building construction and how this fits in with NFPA standards. Reprinted with permission from ISEC.